The Life Of Riley TV show was a comedy series about Chester A. Riley, a very nice man who seemed to find trouble at every turn. When he would discover the mess he was in, he would utter the words that became the trademark of the show, "What a revoltin' development this is!" There was also a Life of Riley Radio Show that ran for seven and a half years from January of 1944 through June of 1951 and a movie of the same name in 1949. 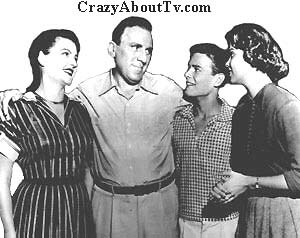 William Bendix also starred as Chester A. Riley on the radio version and in the movie. There was also a 1949 Life of Riley TV Show starring Jackie Gleason as Chester A. Riley! Thank you for visiting our The Life Of Riley TV show page!